Day two for Art Festival at Thornebrook Village in Gainesville. Each day begins with excitement, looking forward to meeting new people, visiting with friends and talking about painting and art. I can't think of many other things I would rather do. Come see me in Booth # 19-A on the south side of the open center patio. The show is open today from 10AM - 5 PM. The Art Festival at Thornebrook is10 AM-5PM Friday and Saturday, Sept. 29-30, 2441 NW 43 Street, Gainesville, Florida. You can find me in Booth # 19 A on the south side of Thornebrook Village. This is always a wonderful event to start your holiday shopping. 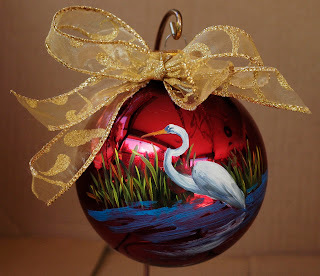 I will have a variety of things for you to choose from including my hand-painted ornaments (White Egret, Roseate Spoonbill, Tom Turkey), note cards, miniature paintings, Fine Art Giclee Reproductions and Original Oil Paintings for home or office. This is the study for my current commission. 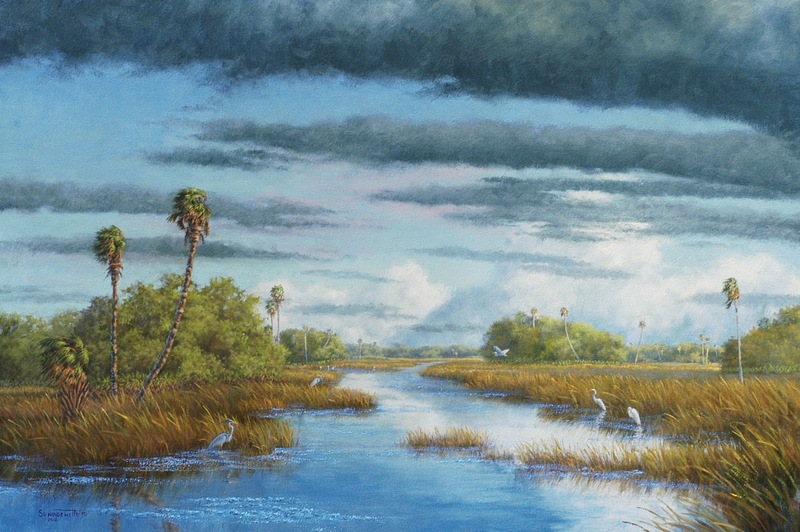 The study is 15"x23", half the size of the final painting, which will be 30"x46". I develop the composition on paper then paint the study for the collectors approval. At this stage we can tweak the study and easily make changes. Solving problems on a smaller scale gives me more freedom than if I went straight from my drawing to the final large canvas. 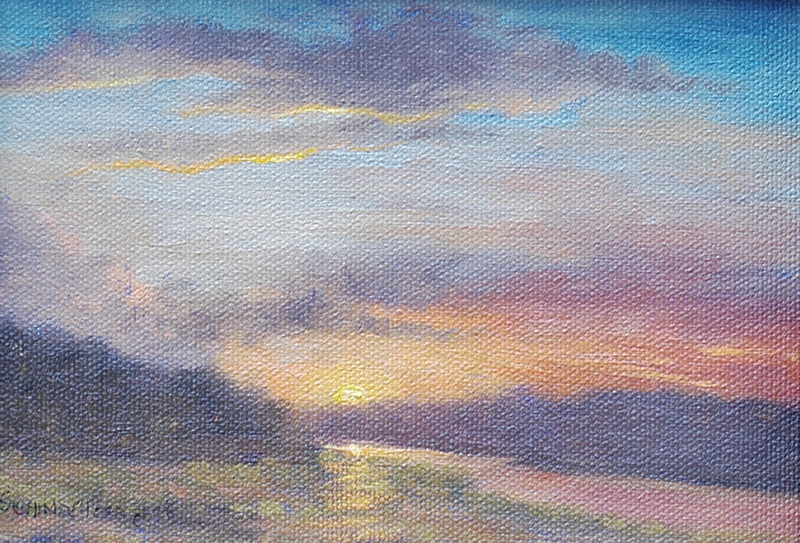 Since the study must be approved by the collector I am confident the large painting will meet their expectations. This process relieves a lot of pressure on me to read the collector's mind accurately and also gives the collector a guarantee that they will like their finished painting. Kathryn Lehman along with a Santa Fe College Vice President purchased one of my paintings at the "North Florida Landscapes" show at Eleanor Blair's Gallery in Gainesville. Of course, I was delighted with the sale. Then, Kathryn called to invite me to be the Poster Artist for the Santa Fe College Spring Arts Festival in March 2013. AND they want to use the painting they had purchased at Ellie's gallery for the poster. That takes a lot of pressure off of me because they already have the exact painting they want for the poster....no guess work. Sorry, I can't post an image of the painting. That is a deep, dark secret until it is unveiled at a Reception in the Presidents office area at the college and then be included in a show of my work that will be exhibited for 3 weeks prior to the Festival. My Booth Fee is waved and I get a prime location next to the info/poster distribution tent so I can sign posters for those who purchase one. Wow! Needless to say, I am excited and very honored!!! 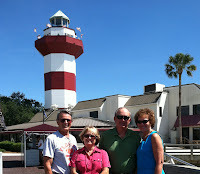 My husband and I visited friends this past weekend at Hilton Head Island, South Carolina. We had never been there and were pleasantly surprised with the laid back, slow pace. I expected the typical tourist frenzy with knick knack shops, putt-putt golf and water parks. Instead I found wonderfully laid out and well planned sections of homes and condos nestled among lots of trees and foliage. There is normal shopping in grocery stores, McDonalds, Starbucks, Walmart, etc. but all are discretely built within a cover of trees....no huge ugly signs lining the streets. The beach is gorgeous. Low tide gives lots of "hard sand" to ride bicycles or walk on and high tide allows even small children to wade in shallow water. 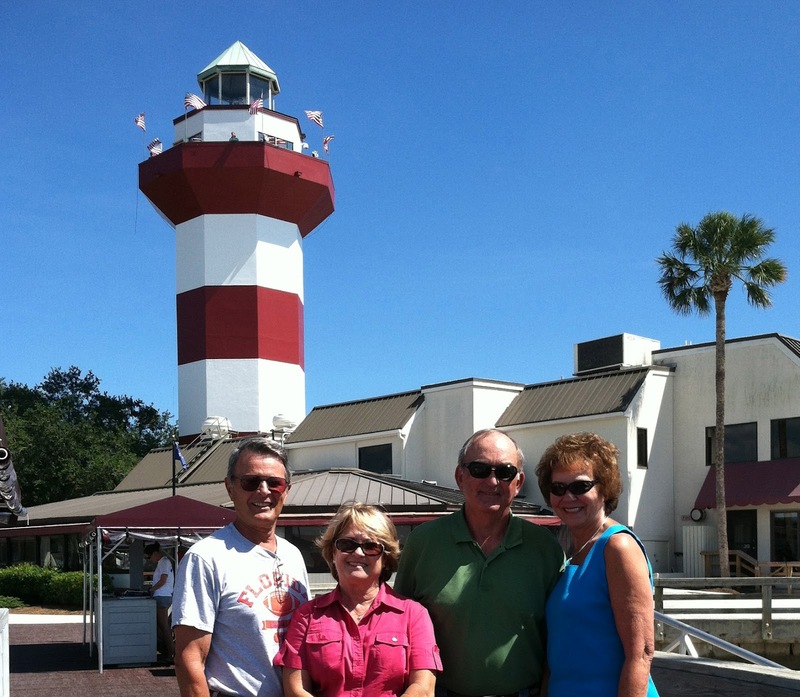 If you havn't been to Hilton Head I recommend you give it a try. It is a bit pricey but manageable for us "normal" folks. That is a lot of Gators! I am a huge University of Florida (Gator) fan. My husband, sons and I all attended the university. We have had football season tickets since 1971. My sons freely ran around the stadium during games and passed a football on the field after games. That was back in the day! Of course, now walking on the field is prohibited. So, when my husband retired a few years ago, he set out on a mission....to see a game in each of the SEC stadiums. He is almost finished with that challenge. We drove to College Station, Texas last weekend to see the Gators VS Aggies game. Yep, it was a very long drive, but worth the trip. The campus is beautiful. Spread out and BIG like everything in Texas. As we strolled the grounds most people we passed (alumni and students alike) said "Howdy, welcome to Texas". Some even tipped their hat. Lots of signage explain Texas A & M's history...beginning as a military school and all male right up to 1965. As a result, they have carried on lots of traditions which includes having an all male Yell Team instead of Cheerleaders with men and women. The ROTC program is still going strong. The University has the honor for the most graduates being inducted into the military than any other University, except for the Military Academies. Of course, the visiting team always gets seats in the nose-bleed section but that was OK because We Won the Game!! I thought this was the last of the SEC stadiums for us but just learned that Missouri has join the SEC and we will play them next year. The fun never ends (tongue in cheek). A commissioned painting is a challenge for me. The collector has a particular image in their head of what they want ... my job is to understand what that idea is and get it on the canvas. Showing the finished painting to the collector is always stressful. Did I interpret their thoughts right? Is the mood of the painting what they want? Did I execute the painting to their liking? ... and the list goes on. Catherine and Bill visited my studio/gallery yesterday to see their painting for the first time. Much to my relief they loved it. Those first few seconds are tense until a smile breaks out. This delightful young couple has looked at my work for several years - usually visiting my booth at the Santa Fe Spring Arts Festival in Gainesville. At the festival last March they took the plunge and commissioned a painting. The painting was successful to a large extent because they had given a great deal of thought to what they wanted and were able to explain it to me. It is refreshing to meet young people with an interest in collecting original art work. They understand what it takes to create the artwork and that it will last a lifetime. By-the-way, Catherine and Bill added a second painting to their collection that afternoon.